Is Celldex's stock about to shoot even higher? Celldex's shares have been in the drink ever since the late-stage failure of its brain cancer vaccine candidate Rintega roughly a year ago. 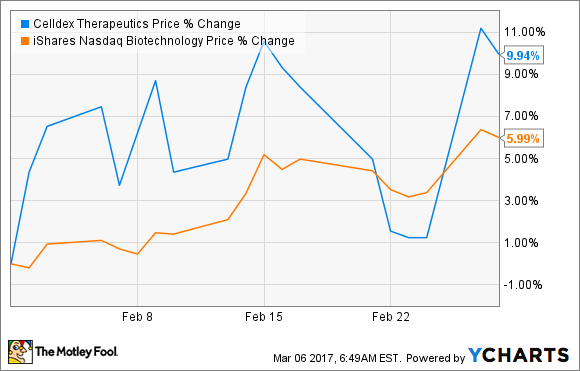 However, the biotech's poor performance over the past twelve months hasn't been entirely its fault. In short, the market took a decidedly "risk-off' approach toward most clinical-stage biotechs over the past year, thanks to the political turmoil emanating from the U.S. Presidential election. So the market's sudden change of heart toward Celldex may indicate that this risk-adverse period is finally starting to fade away. The company's near-term value proposition rests squarely on the shoulders of its experimental antibody-drug conjugate glembatumumab vedotin ("glemba" for short). Glemba is presently in a Phase 2b trial for triple negative metastatic breast cancer (TNBC) that's scheduled to wrap up by year's end. Celldex and its shareholders are hoping that these midstage results will be strong enough to warrant accelerated regulatory filings in both the U.S. and EU by perhaps early 2018. While glemba could haul in some truly impressive sales as an approved treatment for TNBC, the fact of the matter is that the odds are still stacked heavily against a positive readout -- at least if history is any guide. Having said that, Celldex's shares may not fall all that much further in a worst case scenario. After all, the company does have several other high-value clinical assets under development, along with a reasonable cash runway for a developmental biotech. Bottom line: Celldex offers an intriguing risk to reward ratio that could cause the market to bid up its shares in the coming months heading into glemba's top line data readout.